Heavy rain and wind were blowing from the west, almost parallel to the ground. I had my windows rolled up tight on the driver's side, but the wind was still blowing rain all over me through many cracks around the door. I had rolled my right window down a ways because my windshield was fogging up, and I also needed all the fresh air I could get on the inside of the windshield. The tractor I was driving was a short-nosed White, better known among drivers as a "Needle-nose White." The windshield and windows were smaller than normal, so a driver with my large size had to drive with his head in a "bowing" position. The wiper blades were too short, and driving in a heavy rain, I had to bow even a little lower, with my head about 10 inches from the top of the steering wheel. My hands were positioned approximately ten inches apart from the center of the top of the steering wheel. Just as I approached the city limits of Scottsville, a sparrow suddenly flew in through the open window and landed between my hands on the steering wheel. Facing me, he chirped to the top of his little voice. I glanced down at him and that he was looking me straight in the eye. After about ten seconds, the sparrow flew out the window, the same way he came in. 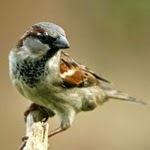 I began to feel very strongly that this little sparrow had been sent by God as a warning for me to stop the truck. As I pulled up to the town square in Scottsville, I felt I could go no further. I sat there fifteen minutes until the wild storm passed. "Did God send that little sparrow to warn me?" I asked myself. When I finally could drive on, my eyes searched the highway, looking for casualties of the storm. Less than a mile down the road, a small Ford Falcon had spun out of the southbound lane, across the northbound lane, finally coming to rest in a muddy clearing. Thank God, no one was hurt. There wasn't even a scratch on the car. 1.) Any bird who accidentally would fly into a moving vehicle would be disoriented and frantic! He normally would fly all around, bumping into the glass windows, trying desperately to get outside. But this special sparrow did none of that. He flew in, perched on the steering wheel, spoke his piece and then left in the same way he came. 2.) How did this little sparrow fly against such a strong wind? He had been flying directly into the wind when he entered the right window of my rig. The gusty wind was blowing heavy rain, leaves, and small limbs almost parallel to the ground. Numerous gusts that hit the side of my truck almost caused me to jackknife as they knocked my heavy truck around like a small toy. 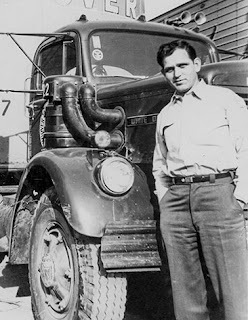 During my twenty years as a professional truck driver, I have faced what seemed like certain death many times. Each time I have found Someone Else in control. I have always had a feeling that Someone was riding beside me, telling me at times when to stop and when to go. Oh, I cannot see that Someone, yet I can feel His presence. It's just as strong as a gusty wind!